IMCDb.org: 1954 Commer QX C-Series MkIII in "Ferry Load, 1960"
A Belgian one , Commers quite popular in Low Countries I believe. 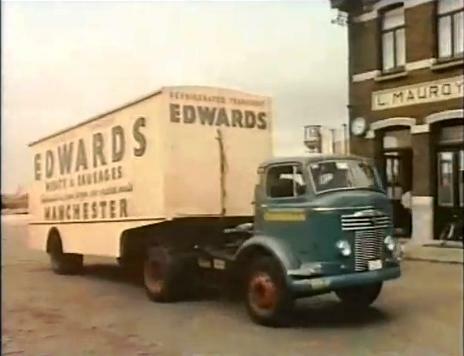 If so - and it looks non-UK plates - the Manchester trailer is interesting - the trailer was the ferried item, not the lorry - see /vehicle_421824-Leyland.html . 1948 date seems very early for one-piece windscreen??? I'm wondering whether the one-piece screen is a trick of the light or aftermarket. AFAIK all QXs with this earlier grille had two-piece screens. You could write most of what I know about lorries on the back of a small postage stamp, so my questions are entirely open-ended. chris40 wrote I'm wondering whether the one-piece screen is a trick of the light or aftermarket. AFAIK all QXs with this earlier grille had two-piece screens. It definitely has a two-piece windscreen (as seen in the movie on YouTube). Oh good, I feel better for that It's a trick of the light then.